Mike Ullery/Call Photo Piqua running back Makeegen Kuhn follows the block of Jerell Lewis. While the rain was very sparse at Alexander Stadium/Purk Field, it really wouldn’t have affected Piqua’s play calling. Ground Indian was rolling again for the second straight week. The Indians rolled up 318 yards rushing against Meadowdale on 27 carries, averaging just less than 12 yards per carry in the 42-0 win. The Indians are averaging almost seven yards per carry for the season, with 774 yards on 114 carries. Quarterback Mick Karn, who is averaging more than 100 yards rushing per game — led the way with 107 yards and two touchdown on seven carries, while running back Makeegen Kuhn had 78 yards and two touchdowns on seven carries. Mixing It Up: Those 27 carries were divided among nine different players, with five of the 27 carries going for touchdowns. Passing Proficiency: Karn completed only one pass all night on three attempts. But, it went for a 20-yard touchdown to Matt Blankenship. Not Wasting Time: Piqua lost the time of possession, despite winning 42-0. The reason why? The six Indian touchdown drives were 68 yards in seven plays; 75 yards in five plays; 55 yards in four plays; six yards in two plays; 55 yards in three plays; and 65 yards in seven plays. That’s an average of five plays per scoring drive. Right Back Where It Started; Meadowdale punted form its own seven yard line in the second quarter. After Trenton Foster’s 28-yard return, Piqua was one yard closer, at the Meadowdale six, leading to the fourth touchdown of the first half. Resting His Foot: One thing Karn didn’t have to do Friday night was punt. Meadowdale’s only two stops came after fumbles by the Piqua second team offense. New Look: Receiver Owen Toopes got some opportunities from the backfield in the second half. He had two carries for 29 yards and a touchdown. Clean Slate: Despite several opportunities to get on the board in the second half for Meadowdale, Piqua came away with the shutout. Interceptions by Karn and Owen Toopes stopped two drives in Piqua territory. Meadodale’s best chance to score was ended by Piqua defensive lineman Grant Toopes, who tomahawked the ball loose from quarterback Elijah Carson and recovered the fumble. 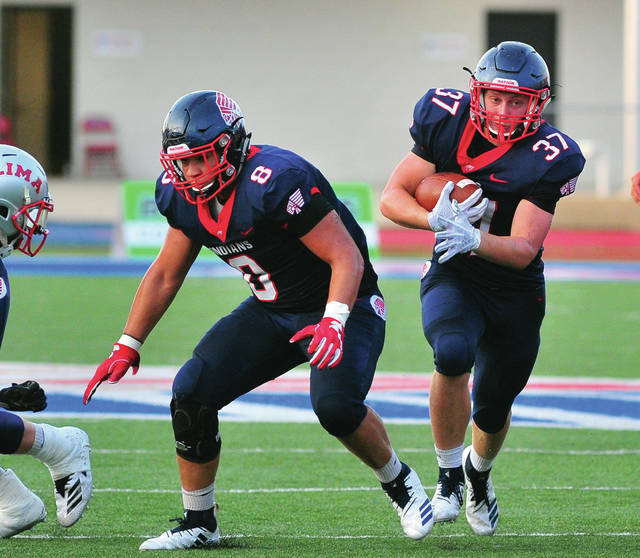 A Toopes sandwich: Piqua’s only sack came when Grant Toopes and Brennan Toopes met at the quarterback, with both being credited for half a sack. Swarm To The Ball: Piqua’s defense was again a balanced effort. Grant Toopes and Lance Reaves led the way with six tackles. Matt Blankenship had five, while Brennan Toopes, Zane Beougher and Nickoah Medley were all credited with four. https://www.dailycall.com/wp-content/uploads/sites/30/2018/09/web1_083118mju_fb_phs_37-1.jpgMike Ullery/Call Photo Piqua running back Makeegen Kuhn follows the block of Jerell Lewis.